It seems like the world has two types of people, the coffee-addicts and the tea-drinkers. People aren’t allowed to drink both tea and coffee it seems. (The fact that I drink both tea and coffee is probably the reason I’m a bit crazy at times.) I usually have no authority whatsoever when I write these face-off-Fridays, but today I actually know what I’m talking about (I think). So today I thought I would try to figure out why we seem to think coffee and tea are so different. Coffee has a really bitter taste, but think about all the caffeine! People like to drink coffee to really wake up in the morning. I mean, it really helps with that morning sh*t. It truly is the best way to start your day. Just don’t forget that too much coffee will give you yellow teeth! There are also a lot of different types of coffee. Cappuccino, Caffe latte, Frappuccino, Espresso, latte Macchiato. Just to name a few. And although they also serve tea at the Starbucks I think Starbucks should be a plus for coffee! (Don’t you just love it when they write your name wrong?!?) And people don’t go on tea dates, do they? If coffee were a person, he would be that exhausted student trying to do everything at once, resulting in only three hours of sleep. That person that always knows better. There are only a few people that actually like him and they usually prefer him when they add a little cream on top. Tea really has a lot of different flavors. They can make tea out of pretty much anything. You want bacon flavored tea, we’ve got it! There’s a type of tea for everyone. It’s great for when you’re sick and usually helps you fall asleep. 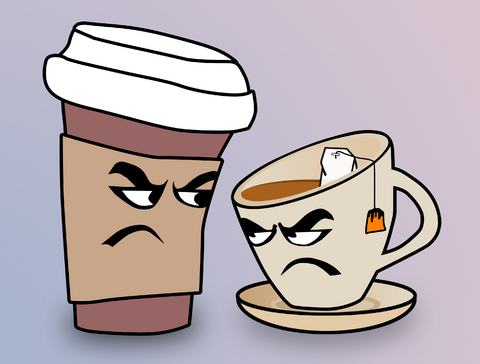 (Maybe coffee and tea really are each other’s opposites?) Because there are so many different flavors, tea can pretty much solve all your problems. You want to sleep? Try some chamomile tea. Got the common cold? Try Echinacea tea. Drink green tea for some extra antioxidants. And get some black tea if you need caffeine, but don’t like coffee. Tea is like Coffee’s relaxed friend. The one that takes yoga classes, knows the difference between different herbs and always looks healthy. They are never stressed and always look calm. It’s impossible to make a tea-drinker get angry. I mean, why is it that every time I drink coffee I feel like I’m cheating, like I’m doing something wrong? And every time I drink tea I feel healthy, like my body is thanking me? Maybe it’s just all in my head!